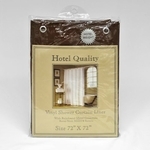 Our extra heavy duty shower curtains / shower liners are made from super heavy weight, 10 gauge vinyl. 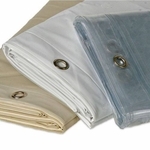 Each shower curtain/liner has 12 rust proof steel grommets. The metal grommets are secured by a reinforced mesh header to ensure a longer life for commercial and high traffic shower areas. 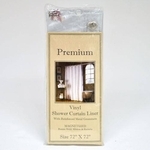 These extra heavy duty vinyl shower curtain liners are thick enough to be used as a standalone shower curtain and liner combo or as a super heavy duty liner used with the addition of a shower curtain to fit your bathroom decor. 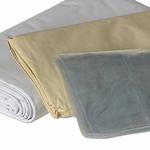 A lifetime anti-mildew treatment protects from mold, mildew and bacteria growth with normal care. Super Clear, Frosted Clear, White, Bone, Black, Slate Blue, and Sage Green.